To Cite: Ahn T, Juhng S, Mok Lee G, Soo Kim H. Musculoskeletal Tuberculosis Presenting as Isolated Tuberculous Gumma in an Immunocompetent Patient, Iran J Radiol. 2018 ; 15(2):e59213. doi: 10.5812/iranjradiol.59213. A 57-year-old woman with no significant past medical history and normal immunity presented with a slowly growing mass on her finger. MR imaging showed a low signal intensity soft tissue mass on both T1- and T2- weighted images with peripheral contrast enhancement. The mass was diagnosed as chronic granulomatous inflammation with caseous necrosis histopathologically and also Mycobacterium tuberculosis by a polymerase chain reaction about the tissue specimen. Authors thought that it was tuberculous gumma presented in an immunocompetent patient. This paper reports a rare case of tuberculous gumma with radiologic findings in an immunocompetent patient. Tuberculous gumma, also known as a metastatic tuberculous abscess, is often secondary tuberculosis in immunosuppressed patients, with diseases such as acquired immunodeficiency syndrome (AIDS), miliary tuberculosis (TB) or leukemia (1). However, it is a rare disease in immunocompetent patients and it is also very rare that isolated gumma is the first clinical presentation of TB in immunocompetent patients (1-3). Radiologic findings of tuberculous gumma, especially in immunocompetent patients have not been reported (4-6). In this report, we discuss a tuberculous gumma on the left proximal third finger in an immunocompetent patient and also describe the radiologic findings correlated with the pathology. A 57-year-old female patient presented with a 2-year history of a palpable mass on her left proximal third finger. She did not have any underlying disease, such as tuberculosis and immunodeficiency. The patient had no history of trauma to her left hand and did not mention any significant medical history, such as a venous puncture. The palpable mass was firm, and had gradually increased in size over the past 2 years; the patient also did not complain of any pain due to the mass or its surrounding area. Physical examination revealed a 3 × 3 cm swollen mass without any abnormal findings such as erythema, ulcer, and discharge on the overlying skin at the ventral surface of her left third finger (Figure 1). Her body temperature was within normal range, and a chest radiograph showed no evidence of pulmonary tuberculosis. A sputum and urine culture were negative, laboratory testing showed a normal blood cell count, and a human immunodeficiency virus test result was negative. 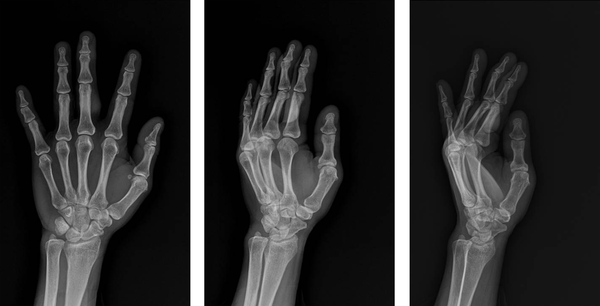 Hand radiographs showed a large soft tissue mass with a broad base at the ventral side of the left proximal third finger, but no evidence of abnormal bony findings such as a periosteal reaction was shown (Figure 2). MR imaging revealed a well-defined soft tissue mass on the ventral side of the left third proximal phalanx, which was broadly abutted to the flexor tendon but did not involve the bone or adjacent joint. The mass showed heterogeneous signal intensity and contained multifocal dark signal intensity portion on the T1 and T2 weighted images (Figure 3). On enhanced T1 weighted images, the mass showed a peripheral rim enhancement, but the central portion of the mass was not distinctly enhanced. The mass was completely removed by an orthopedic surgeon and operative findings reported that a well-demarcated 2 × 2 cm mass with central necrosis abutted the 3rd flexor tendon. Histopathology of the mass showed chronic granulomatous inflammation with caseous necrosis, giant cells and granulomas (Figure 4). Acid fast bacillus and periodic acid-Schiff stains did not demonstrate acid-fast bacilli or fungi but a polymerase chain reaction (Real-Q MTB and nontuberculous mycobacteria kit, Biosewoon, Seoul, Korea and CFX96TM Real-Time System, BioRad, California, USA) for Mycobacterium tuberculosis was positive. The patient was treated with quadruple therapy consisting of isoniazid 75 mg, rifampicin 150 mg, pyrazinamide 400 mg, and ethambutol 275 mg daily for 3 months and authors have not found any problems in 9 months of follow up. Figure 1. Hand photograph shows an approximately 3 × 3 cm sized soft tissue mass on the ventral aspect of the proximal 3rd finger without any abnormal findings such as erythema, ulcer, and discharge on the overlying skin. The black spots at the base of the mass are ink. Figure 2. Plain radiograph of the hand shows a soft tissue mass on the ventral aspect of the 3rd finger without bony erosion or bony remodeling, and no calcification is visible within the mass. Figure 3. Magnetic resonance imaging, T2- (A and D) and T1- weighted images (B and E) show a soft tissue mass with heterogeneous signal intensity within dark signal intensity in all sequences. Gadolinium enhanced fat suppressed T1 weighted images (C and F) show a central non-enhanced portion and peripheral enhancement. Figure 4. 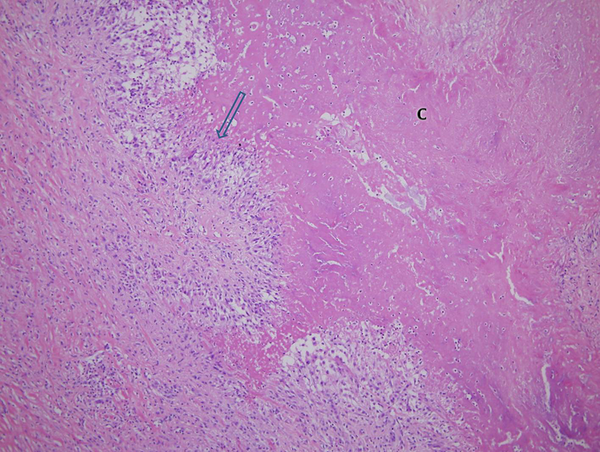 Microscopic examination shows geographic acellular area with caseous necrosis (C), surrounded by epitheloid histiocytes (thick arrow). These findings are consistent with caseating granulomatous inflammation (H & E staining, × 50). Musculoskeletal tuberculosis is reported in only 1% - 3% of cases of tuberculosis and is usually mistaken for a tumor or abscess by other pathogens because it is only confirmed by a histologic analysis and tissue culture (4, 5). Soft tissue infection of tuberculosis was more common in nontuberculous mycobacteria (NTM) than Mycobacterium tuberculosis. Cutaneous infection of NTM usually occurs in immunosuppressed patients, after traumatic injury and after cosmetic or surgical procedures (6). In musculoskeletal tuberculosis, metastatic tuberculous abscesses, also called tuberculous gummas, are the result of a subcutaneous tuberculous process that leads to cold abscess formation and secondary breakdown of the overlying skin, resulting in skin ulceration (2). The physiopathological mechanism is that it is actually a consequence of metastatic spreading via the blood, of latent mycobacteria, which form abscesses most frequently in the limbs or trunk, usually sparing deeper tissue (7). But this mechanism was only supported secondary TB in immunosuppressed patients and was not explained in this case, because this patient did not have a history of tubercuolosis, and had negative findings in her plain chest radiography. She was also an immunocompetent patient. In other previous reports, BCG vaccination was noted to be a trigger for tuberculous gumma, which was found in countries with high endemicity of tuberculosis (8, 9). Considering that our patient has been living in a country with high endemicity of tuberculosis and also has been vaccinated with BCG, tuberculous gumma is a possible cause for the mass on her finger. We also thought whether the mass is BCG-osis. However, she had taken the BCG vaccine as an infant, so the interval between BCG vaccination and the time when the mass was found was very long. BCG-osis usually occurs in immunocompromised patients. Therefore, the possibility that the mass confirmed BCG-osis is very low (10). Vidal et al. (1) reported that the venepuncture in immunocompetent patients had played a part in the development of the direct cutaneous infection of tuberculosis. It could possibly be the trigger for formation of tuberculous abscess in immunocompetent patients. However, our patient had neither a history of trauma nor acupuncture on her finger. Tuberculous tenosynovitis should also be considered because the mass was very close to the tendon upon MR imaging. Tuberculous tenosynovitis appeared to be a varied form due to the duration tuberculosis; in the hygromatous stage, there is fluid collection in the tendon sheath and in the serofibrinous stage, thickening of the tendon and synovium with multiple rice bodies are shown (11). 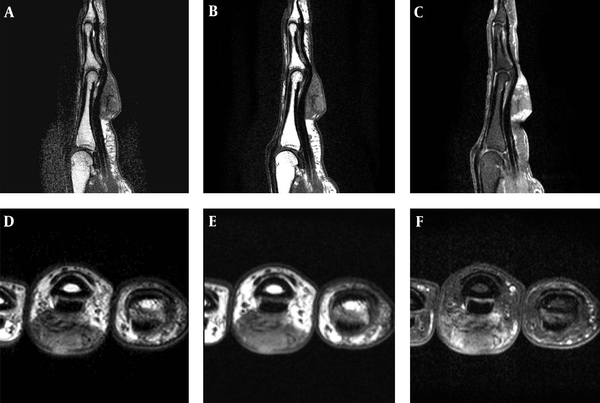 In the present case, our patient had only a mass with a sharp angled margin from the tendon and no fluid collection or no tendon thickening on her MR imaging. The low signal intensity of T1 and T2 weighted images in the mass showed a non-enhanced central lesion on an enhanced T1 fat suppressed image. This implied caseous necrosis on the specimen, supporting a case for tuberculous gumma (12). The authors also thought that it was possible for fibroma to arise in the tenodon sheath or giant cell tumor of the tendon sheath (nodular type pigmented villonodular synovitis) because it was broadly attached to the flexor tendon. A low signal intensity on T1- and T2-weighted images was shown, but they could be excluded by a contrast enhancement pattern. The tuberculous gumma is needed for differentiation with other chronic granulomas such as rheumatoid nodule and Cryptococcus infection. Rheumatoid nodule is one type of chronic granulomas and its radiologic findings is similar with our case (13). However, it does not have caseous necrosis in pathology and is negative in TB polymerase chain reaction (TB-PCR). Cryptococcus infection in the skin and subcutaneous fat is induced chronic granuloma with caseous necrosis, but it usually occurs in immunocompromised patients. This case has some limitations. Mycobacterium tuberculous bacilli in this case were not demonstrated by Acid Fast Bacillus and periodic acid-Schiff staining or tissue culture. However, tuberculous gumma was diagnosed with both pathologic findings and PCR results. The PCR of the tissue specimen for Mycobacterium tuberculosis complex was positive and for NTM negative, which are suggestive that it is also possible about other Mycobacterium tuberculosis complex, such as Mycobacterium bovis, Mycobacterium bovis Bacillus Calmette-Guerin, Mycobacterium africanum, and Mycobacterium canetti. However, in the country the patient lives, Mycobacterium tuberculosis complex, except Mycobacterium tuberculosis, is very rare. Our country is also a TB endemic area and infants of our country have to take BCG routinely. Therefore, both histology of the mass and positive PCR test strongly suggest the diagnosis of tuberculous gumma. In addition, tuberculous gumma in a finger of our case might be the first clinical presentation of multifocal occult TB. So, our patient needed evaluation of occult TB lesions, such as whole body CT (1, 9), but she rejected further radiologic studies. Finally, this case is a very rare case with possible specific radiological findings of spontaneous tuberculous gumma on the finger in a patient without a history of tuberculosis and immunodeficiency. When a slowly growing soft tissue mass containing a necrotic portion on imaging study is encountered, tuberculous gumma should be included in a differential diagnosis in a high endemic area of tuberculosis even though it is a rare occurrence. This paper was supported by Wonkwang University in 2016. 1. Vidal D, Barnadas M, Perez M, Coll P, Alomar A. Tuberculous gumma following venepuncture. Br J Dermatol. 2001;144(3):601-3. doi: 10.1046/j.1365-2133.2001.04093.x. [PubMed: 11260024]. 2. Almagro M, Del Pozo J, Rodriguez-Lozano J, Silva JG, Yebra-Pimentel MT, Fonseca E. Metastatic tuberculous abscesses in an immunocompetent patient. Clin Exp Dermatol. 2005;30(3):247-9. doi: 10.1111/j.1365-2230.2005.01728.x. [PubMed: 15807681]. 3. Ko MJ, Wu CC, Chiu HC. Tuberculous gumma. Dermatol Sinica. 2005;23(27-31). 4. Caksen H, Arslan S, Oner AF, Kuru M, Karakok M, Odabas D. Multiple metastatic tuberculous abscesses in a severely malnourished infant. Pediatr Dermatol. 2002;19(1):90-1. doi: 10.1046/j.1525-1470.2002.0024b.x. [PubMed: 11860584]. 5. Parker L, Babu S. Tuberculous gumma: a forgotten entity in the UK. BMJ Case Rep. 2013;2013. doi: 10.1136/bcr-2013-010462. [PubMed: 24072828]. 6. Atkins BL, Gottlieb T. Skin and soft tissue infections caused by nontuberculous mycobacteria. Curr Opin Infect Dis. 2014;27(2):137-45. doi: 10.1097/QCO.0000000000000041. [PubMed: 24464139]. 7. Abu-Salem OT. Tuberculous abscesses of the quadriceps femoris muscle without osseous involvement. East Mediterr Health J. 2000;6(5-6):1136-8. [PubMed: 12197341]. 8. Sen RK, Triapathy SK, Deivaraju C, Das A. Isolated focal pyomyositis of teres minor: an unusual presentation of tuberculosis. Acta Orthop Traumatol Turc. 2011;45(4):276-9. doi: 10.3944/AOTT.2011.2447. [PubMed: 21908969]. 9. Sabat D, Kumar V. Primary tuberculous abscess of rectus femoris muscle: a case report. J Infect Dev Ctries. 2009;3(6):476-8. doi: 10.3855/jidc.421. [PubMed: 19762963]. 10. Rival G, Garot D, Mercier E, Narciso B, Legras A, Perrotin D, et al. [Acute respiratory failure and septic shock induced by Mycobacterium bovis. A rare side effect of intravesical BCG therapy]. Presse Med. 2006;35(6 Pt 1):980-2. doi: 10.1016/S0755-4982(06)74732-7. [PubMed: 16783258]. 11. De Backer AI, Mortele KJ, Vanhoenacker FM, Parizel PM. Imaging of extraspinal musculoskeletal tuberculosis. Eur J Radiol. 2006;57(1):119-30. doi: 10.1016/j.ejrad.2005.07.005. [PubMed: 16139465]. 12. Kim TK, Chang KH, Kim CJ, Goo JM, Kook MC, Han MH. Intracranial tuberculoma: comparison of MR with pathologic findings. AJNR Am J Neuroradiol. 1995;16(9):1903-8. [PubMed: 8693993]. 13. Sanders TG, Linares R, Su A. Rheumatoid nodule of the foot: MRI appearances mimicking an indeterminate soft tissue mass. Skeletal Radiol. 1998;27(8):457-60. doi: 10.1007/s002560050418. [PubMed: 9765141].